Hong Kong – 14 August 2017 – Aircraft Recycling International (“ARI"), the first full life solutions provider for used aircraft in Asia, is pleased to announce that the company was presented with"The Best M&A Management Award"by the China Mergers and Acquisitions Association (“CMAA") at the organisation’s 20th Anniversary Gala Dinner. The award appreciates outstanding efforts which ARI has made in the full acquisition of U.S. based Universal Asset Management (“UAM"), by which ARI has set up a valuable reference for similar transactions in the future, by being the first Chinese enterprise that completed a cross-border acquisition of an US aviation enterprise. CMAA is committed to taking forward the regularisation and professionalisation of domestic capital and merger and acquisition (“M&A") markets. 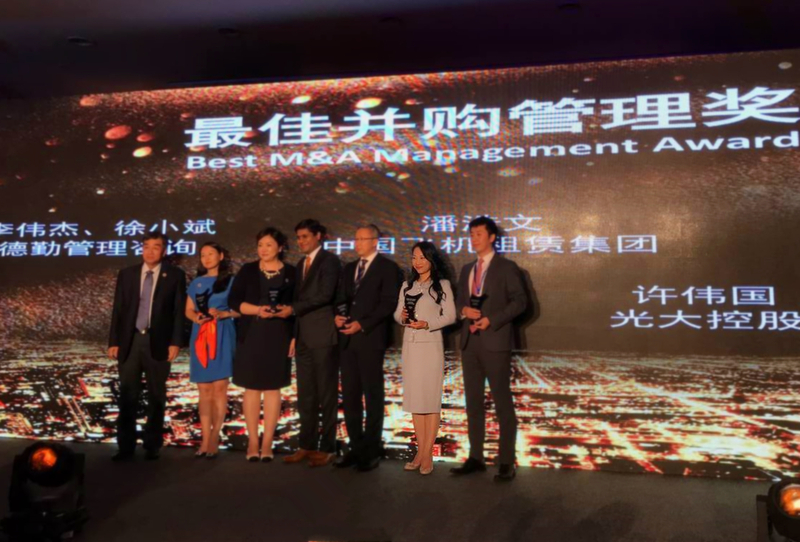 Assembling government representatives, business elites and industry experts, CMAA’s China M&A Annual Conference is a significant platform for sharing updates and case studies of the Chinese M&A sector. While the annual conference is a high-profile industry event in Asia Pacific, the award is being perceived highly credible. Not only does"The Best M&A Management Award"endorse ARI’s capability in acquiring overseas aviation enterprise, it also further reinforces ARI’s unique position as the first full life solutions provider for used aircraft in Asia. ARI acquired a 100% equity interest in UAM in March 2017. Through acquiring one of the world's leading global aviation services providers based in Tennessee, the US, ARI created a global platform for used aircraft solutions. UAM, now a wholly owned US subsidiary of ARI, is responsible for ARI's aircraft recycling business overseas, and a part of its global disassembly and distribution platform. Together with ARI’s aircraft recycling facility in Harbin, China, the world’s largest aircraft recycling centre, the alliance of ARI and UAM amply refines the downstream business of the full value chain of their mother company, CALC, and further strengthens CALC’s position a one-stop full value chain aircraft solutions provider globally. In addition, the acquisition accomplished the essential step of CALC’s globalisation strategy. Synergy is created along the global aviation value chain through consolidating resources and expanding customer base and business network, which enlarges the overall industry scale and enhances the influence of the group in the global aviation industry. Ms. Christina Ng (2nd right), the Deputy Chief Executive Officer, and Chief Operating Officer of ARI, receives"The Best M&A Management Award"
Ms. Christina Ng, the Deputy Chief Executive Officer, and Chief Operating Officer said,"We are grateful that the acquisition of UAM gained recognition from CMAA. The cross-border acquisition of UAM is a non-precedential case that a Chinese enterprise fully acquired a US aviation enterprise, which marked a milestone for ARI in extending downstream business of the aviation value chain. It has also become an essential reference for the future cross-border acquisitions by Chinese enterprises. In this acquisition, ARI and UAM valued not only the price but also the potential synergies where both can unleash their competitive advantages, exhibit their business complementarities and collaborate for new business development. UAM attached extra attention on the promising resources provided by ARI for its future development. In this acquisition, ARI’s thorough preparation, detailed analysis on potential issues and formulation of corresponding solutions are all keys to success. At the same time, ARI also built a professional team in the US, especially for this cross-border acquisition. This strengthened the integration and communication between teams from different cultural backgrounds and business models, and facilitated the completion of the acquisition." Ms. Ng continued,"We placed high hopes on the results of this cross-border acquisition. It is expected that ARI and UAM will build on each other’s competitive strengths and maximise the synergies. In parallel, ARI will benefit from UAM’s rich resources which include: brand equity, cutting-edge technologies for aircraft tear down and disassembly, operational experience, industry certificates and recognition from airline customers, as well as the well-established network with market leaders. Besides, the aircraft tear down and disassembly plant of UAM in Tupelo, Mississippi, together with the world’s largest aircraft recycling centre of ARI in Harbin, China will be capable to meet the global demand for mid-to-late life aircraft solutions and asset management. As such, we believe this acquisition will optimise ARI’s strategy of building a global platform of aging aircraft solutions, as well as provide a valuable reference for Chinese enterprises to acquire foreign aviation enterprises."